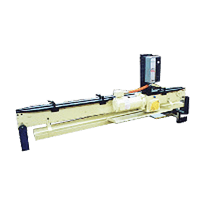 Model 1650 — The Feedall line of Thru-Feed Conveyors offer entrance, intermediate and exit capabilities for a wide variety of machine tools and processes including centerless grinding, thread rolling, belt finishing, heat treating and assembly. Special design considerations allow these conveyors to operate in harsh environments (oily, chips, grinder swarf, etc.). Conveys steel shafts from a centerless grinder and cam-off into a storage tray for operator pick-up. Conveys steering racks from the workrest of a centerless grinder to the workrest of another centerless grinder. Racks exit the first grinder and are conveyed into a transfer device. The transfer discharges the parts uphill and onto a rolling ramp. The parts exit the ramp onto an infeed ramp attached to an entrance conveyor. The conveyor conveys the parts into a pinch wheel device that aids the parts into the grinder. Conveys steel bushings from Acme centerless wire brush to end finisher. Convey punch and dies to the workrest of a Cincinnati 350-20 centerless grinder. Conveys steel shafts to the workrest of a Cincinnati centerless grinder. Conveys outer bearing races between the workrest of two KOYO centerless grinders. Conveys carbide blanks from the workrest of a Cincinnati Model 340-20 centerless grinder to the workrest of a Landis Viking centerless grinder. Conveys carbide blanks from the workrest of two Landis Viking centerless grinders. Conveys carbide blanks from the workrest of a Landis Viking centerless grinder. Conveys steering rack blanks to the workrest of a Cincinnati model 350-20 AE centerless grinder. Conveys agitator shafts from a centerless grinder to a cam-off accumulation ramp. Conveys universal joint bearing cups from the workrest of a Cincinnati Model 340-20 centerless grinder. Conveyor is equipped with special air-operated, diverter device to transfer out of spec product into a reject container.